On 2 December 1971 Dubai, together with Abu Dhabi and five other emirates, formed the United Arab Emirates after the former protector, Britain, left the Persian Gulf in 1971. In 1973, Dubai joined the other emirates to adopt a uniform currency: the UAE dirham. 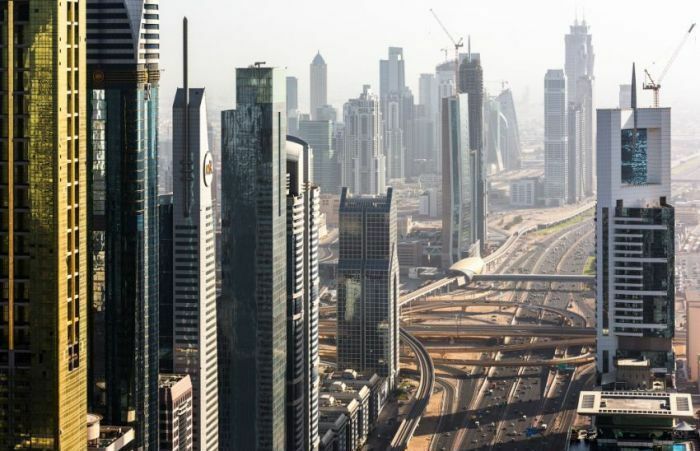 In the 1970s, Dubai continued to grow from revenues generated from oil and trade, even as the city saw an influx of immigrants fleeing the Lebanese civil war. Border disputes between the emirates continued even after the formation of the UAE; it was only in 1979 that a formal compromise was reached that ended hostilities. The Jebel Ali port was established in 1979. Jafza (Jebel Ali Free Zone) was built around the port in 1985 to provide foreign companies unrestricted import of labour and export capital. The Gulf War of 1990 had a huge effect on the city. Depositors withdrew massive amounts of money from Dubai banks due to uncertain political conditions in the region. Later in the 1990s many foreign trading communities—first from Kuwait, during the Gulf War, and later from Bahrain, during the Shia unrest—moved their businesses to Dubai. Dubai provided refuelling bases to allied forces at the Jebel Ali free zone during the Gulf War, and again during the 2003 Invasion of Iraq. Large increases in oil prices after the Gulf War encouraged Dubai to continue to focus on free trade and tourism.